Sending out quinceañera invitations is as important as the event itself. After all, these will tell friends and family where the festivities are being held and give them an idea of your quinceañera's theme and style. Print either of these designs onto card stock or photo paper using Adobe Reader. The photos in the invitation graphics will not appear on your invitations once they are downloaded. To add your own photo once the invitations are downloaded, simply click in the empty space where indicated and add a photo of the special girl. Personalize the invitation wording by clicking on the text box and entering your own details. The pink and purple invitation above is more traditional and would work well for a princess, ball, or candy theme. The turquoise invitation has a contemporary feel that can be used for a number of different themes or reception styles. Click to download and print this invitation. 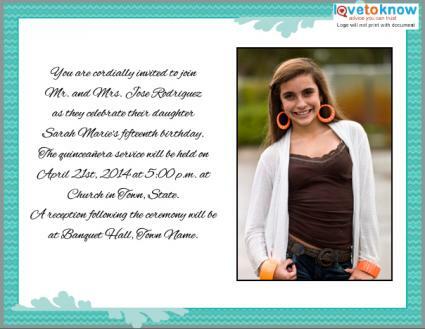 How the invitation is worded and how it looks really depends on the ceremony, reception, young girl, and her family. Some choose to have a more religious-focused ceremony, while others are informal and might focus more on the reception and birthday, and the invitations will reflect this. Traditional quinceañera wording tends to be formal, but many families choose to forgo this and create a festive invitation all their own. No matter what your style is, be sure to include who the party is for, where and when it's being held, and the reason for the celebration. A wonderland of (snow/candy/other theme) awaits you as we join together for Name's fifteenth birthday. Enjoy an enchanted evening with the Last Name family as they celebrate Name's quinceañera. By God's grace and with His wisdom, Name is turning 15. While most families choose to send out invitations in English, many young ladies pay homage to their heritage by including a line, Bible verse, proverb, or poem in Spanish. If you choose to do so, include the translation as well. Other designs might feature a photo of the birthday girl or may have a formal black and white motif. Purchased invitations are available through a number of stationery and party retailers. Pricing usually varies by the number purchased and intricacy of the design chosen. Quinceanera Mall sells several different invitations, from themed ones for masquerade balls, to tubes and scrolls, to religiously themed ones featuring the Virgin De Guadalupe. The Joyful Events Store is a sister site that has many of the same invitations available, as well as a few different ones. Quinceanera-Boutique.com has a large variety of invitations, especially themed ones featuring Cinderella balls, butterflies, winter wonderland, and photo options. Ordering options are listed in both English and Spanish. Quinceanera Prints has numerous invitations that you can shop for by style, from animal print, to stars, to flowers, to photos. Special designs include 3D versions featuring purses and boxes. Additional matching stationery, like thank you cards, is also available. These companies offer customer service in both English and Spanish, and are available through email, 800-number, or FAQ page, if needed. Want to have inexpensive DIY quinceanera invitations? Customize an invitation from The Printable Holiday online and print them yourself at home. RSVP card: Events held at formal ballrooms or banquet halls may need to have an approximate attendance count a week or two in advance. Map and directions: If the reception will be held somewhere other than the church, including a map with directions on how to get from one location to the other is helpful. Guests who may not have attended a quiceañera before may not be familiar with the celebration. Therefore, you may also want to note additional special information, like "formal attire," with the invitations and enclosures. 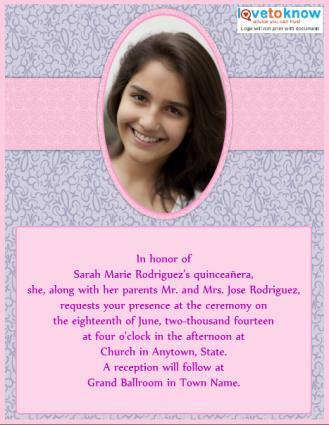 Planning a great quinceañera means you'll need to get the word out to friends and family with a memorable invitation. Whether you go with a basic one so you can plan details later or choose to find a themed or personalized one, it is sure to get guests excited for the upcoming fiesta!